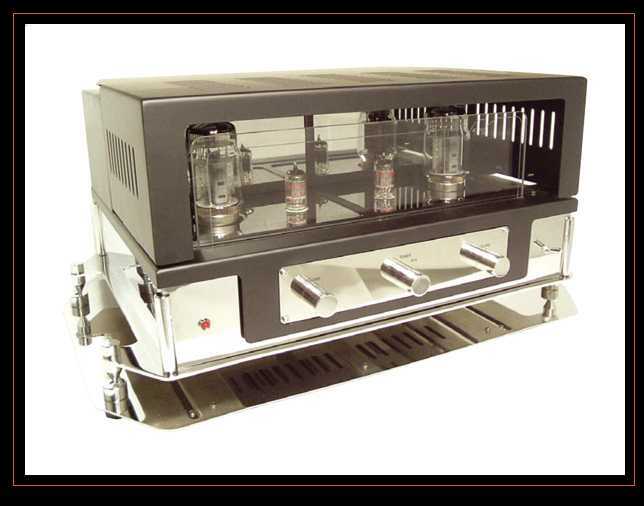 The VXSE-KT88C is a tubed integrated amplifier of single-ended aspiration and purist persuasion. A truly minimalist design. The front panel provides seperate volume controls [Alps Blue series] for the left and right channels, and a 3 input selector switch - I cannot understand why everyone else does not do it this way. The only thing I would ask for is some calibrated markring on the left and right volume knobs so listener can balance the channels properly [maybe the minimal thing got carried a too far]. A fairly unique looking unit, but I can't make up my mind if I like the aesthetics or not. 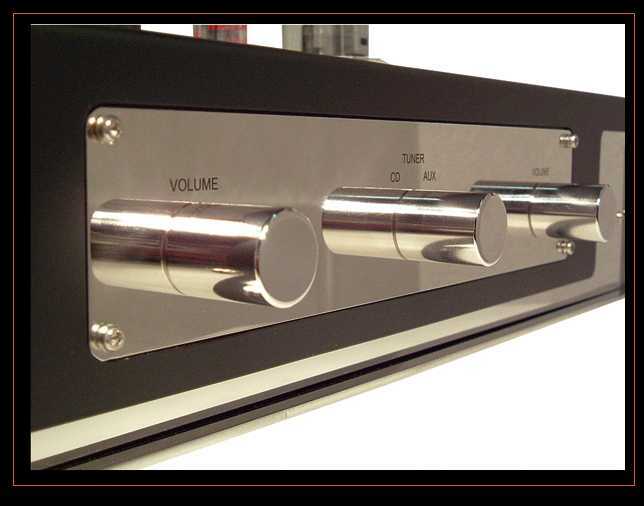 While each individual facet; whether it be the control knobs, the face plate or the legs; are beautiful in of their own. There is a lack of coherence of all the pieces put together - instead it seems more like a pile of nice parts. Quite a fuss has been made about isolation in this design - the chassis sits on an integrated polished chrome plate, to which 4 cones are fastened. The cones sits on another polished chrome plate, which finally sits on feet of a soft compliant material [rubber, I suspect]. As far as the aesthetics and isolation features are concerned, I am not too fazed one way or another - all I care about is how the thing sounds. From a purist's point of view the design is exquisite - no remote, no tone controls and even dual volume pots. The rear feature three single ended inputs, one set of speaker connectors and an IEC receptacle. Alas, he review sample did not provide 8 and 4 ohm taps, but they have since assured me that current production does provide this facility. Since they were not yet selling in North America when the samples were sent, Giampaolo of Vexo Hifi was willing to convert a review sample to 120V operation. Alas, my review sample had considerable hum from the transformer - which I was told they would work out before venturing into the 120V market, which they have begun as of recently. Owner's manual was only provided in Italian [but seemed quite comprehensive], I hope an English version is provided when this product hits international markets. I was very surprised how well this amp drove my Dynaudio Contours. I was fully expecting the speakers to prove too taxing and the sound to be a bit starved. While those limitations did come into play when I attempted highish volume levels, I was very surprised at what beautiful music I heard at low to moderate volumes. And for what it did well, it did very well - detail and dynamics were not lacking in any way. The best way to characterize the tonal balance is - easy to listen to and beguiling. If this amp worked well with the Dynaudio's, then it really sang with the Tonnian Labs DL-1 [95db sensitivity and 8ohm nominal impedance]. Most remarkable, were the dynamics that this combination produced. Additionally, as with the Dynaudios the detail was also very impressive. 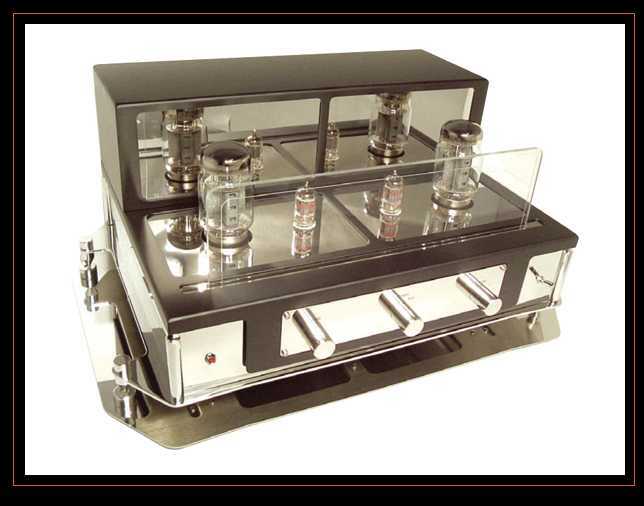 With both speakers, what was abundantly obvious was the classic naturallness and of instruments and immediacy of transients that is hallmark of class-a amplifiers; especially single ended tubed ones. I would easily live with this amp and a pair of speakers that had modest power needs, such as the Tonian Labs DL1 [review upcoming] for a long time. I did not buy the review sample, since I already have a class-a amp that provides me with the positive aspects of the Vexo, but additionally has the capability of handling pretty much any speaker I have thrown at it so far. And the Vexo had nothing sonically that lured me away from my current setup. In my opinion, the sentence "There is a lack of coherence of all the pieces put together - instead it seems more like a pile of nice parts" reflects an absolutely personal evaluation, that is to say a subjective judgement that therefore bears nothing but a detatable value. All in all, it's a matter of individual taste. As far as it regards the supposed "fuss [...] about isolation in this design" I feel bound to precise what it follows, in order to clear what has not been possibly understood. The chassis is "purposely" designed to sit on four spikes matching to four feet within a separate plate offering an anti-vibrating solution. To my mind, such function is quite evident and actually effective: that is to say, to isolate the equipment, and therefore the tubes, from noises and vibrations that could affect the sound. In practice, by isolating the amplifier with spikes resting on a separate "anti-vibrating" plate, we do perform an efficacious un-coupling. The effectiveness of such solution has been tested by renowned Italian and international audio magazines (Audio Review n�285 e n�289 , Fedelt� del Suono n�151, Stereo & Image n�34) that could directly report how positive the apport of an un-coupling plate is with reference to the ultimate audio performance, with a special mention to sound control. I seize the occasion to underline that the plate is being provided as an integral part of the whole equipment. The 120V transformer, a first sample purposely manufactured for the review, was previously tested and so was the amplifier, according to Vexo's quality control. No hum at all was apparent during the listening sessions. Something has been possibly sorted out anyway. I personally make my excuses to the reviewer for such annoying incovenience. It's my duty to inform that the amplifiers being currently distributed to the United States by KoetsuUsa do not suffer from this defect at all, following our pride of manufacturing particularly noiseless equipment. As Arvind Kohli correctly infers, the current model provides both 8 and 4 ohm taps. 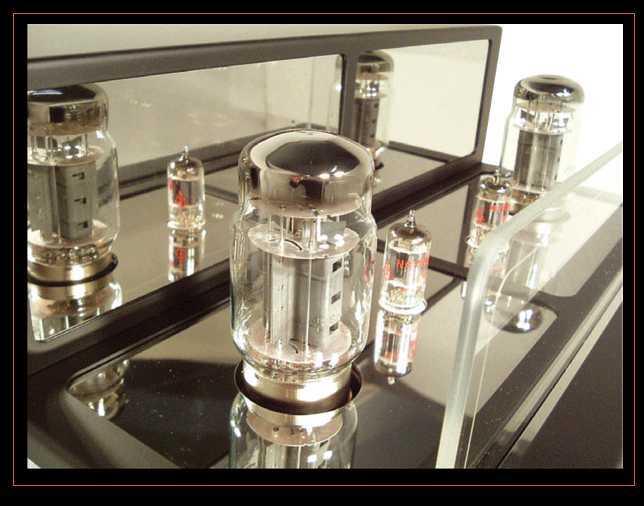 All in all, I sincerely thank Arvind Kohli for the precious and supporting considerations about the driving and sound performance of our "baby" single ended tube amplifier. I think it has to be stressed that we're talking about our entry level product and more generally about an amplifier offering just 15 + 15 watts, with all the merits and inevitable limitations relevant to such a low wattage. It will be compulsory to resort to other equipment from our catalogue to improve some parameters, indeed. Last but not least, everything being pointed out in the review will be hold in due consideration, with a special attention to any criticism, which will put us to a hard job striving to fill in any possible gaps.